The Yamamoto Kreature is not a Senko, an IKA or a twin tail grub but provides the features of all in one package. Loaded with salt and designed with a super soft plastic the Kreature is designed to attract plenty of attention. Utilizing a ribbed body style like the Senko, the Kreature starts with two large curly tail arms which provide excellent twirling action on the fall or when the bait is swam over bottom structure. Moving down the body two large paddle appendages offer additional movement and appearance while the free flowing tentacles at the end of the body give the same action as that of IKA tube. 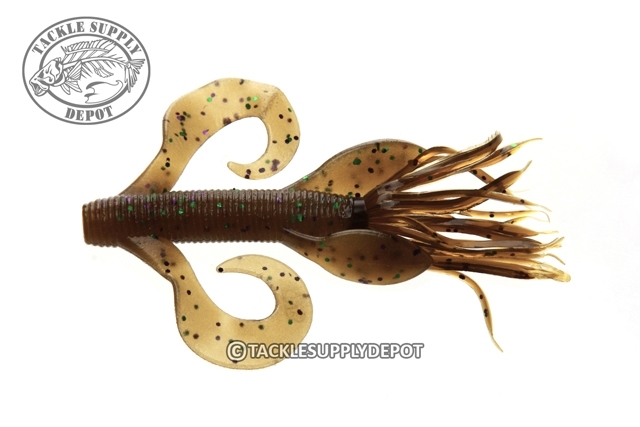 This big bait excels as a pitching and flipping bait around wood, docks and sparse grass as well as is awesome when rigged on a football head and slow rolled over bottom structure. When cover gets thick rip the two curly arms off the body and you have a profile that is ideal for punching vegetation.